Was located east in the alley in the 500 block of Grand Ave.
April 10th, 1913— The material is being hauled into place for the new creamery, for which Sampson Grotness has the contract. The building will be made of brick and thoroughly up to date in every particular. 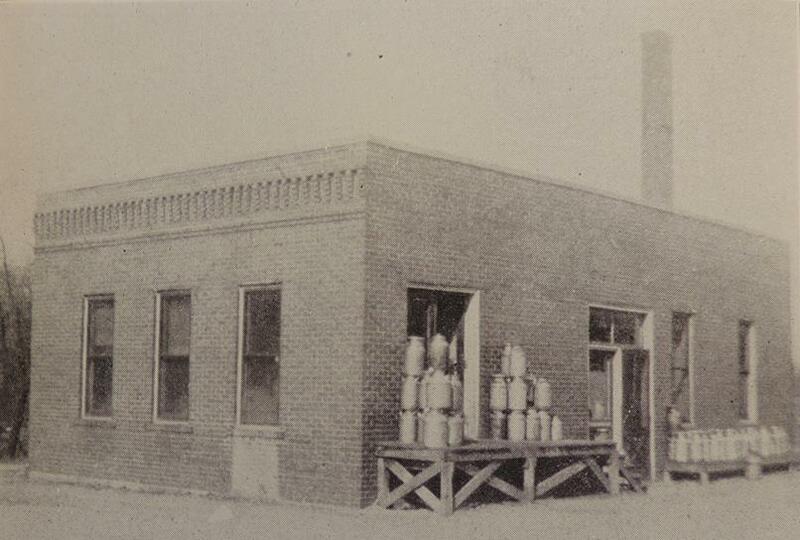 Sept. 25th, 1913— The creamery is now located in new building. The old building is being torn down this week, the material having been sold to various parties. In the new building the local creamery company are finally equipped for turning out good, wholesome butter in the most economical manner. 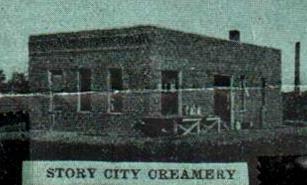 According to the 1931 Story City Golden Jubilee Book, the creamery was doing $150,000 worth of business a year. Was located where Bethany Manor is currently. May 1st, 1913— Story City was full of contractors from all over the state on Tuesday bidding on the construction of the sanitarium, hotel, and auditorium. Contract for the sanitarium was let to C.F. 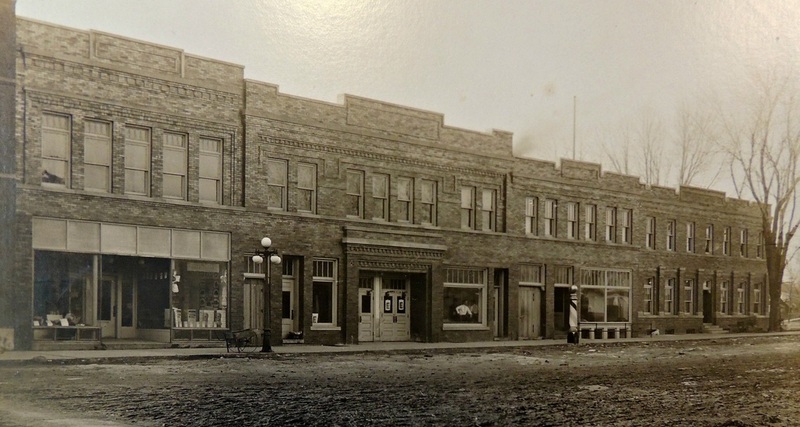 Reimer & Co. of Marshalltown, who offered to put up the building without heating and plumbing for $19,493. May 8th, 1913— The total sum subscribed to date is $27,500, donated by about 550 people, making an average subscription of $50. A considerable part of this amount is not yet available, as many of the subscriptions were made on the two, three, or four year payment plan. It should be stated that not one cent of subscriptions has been spent in hiring solicitors. Subscribers can be sure that every dollar they contribute goes directly into the building of the sanitarium and home. Two-thirds of the money so far subscribed has been given by people in or near Story City and five acres of land have been donated to the institution by local people. May 22nd, 1913— The contract for plumbing and heating awarded to T.T. Holm. His bid was lowest, being $4,800. 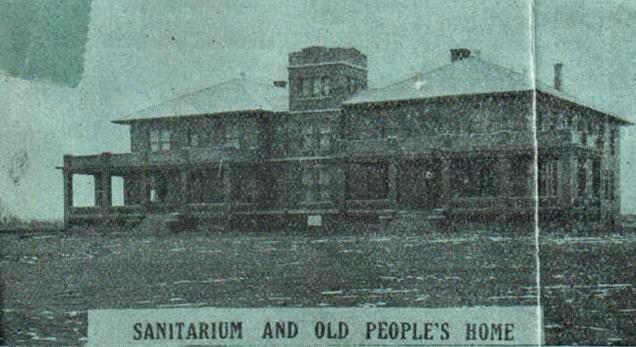 June 5th, 1913— Mr. Cole of Ames has been given the contract to build sanitarium. The Marshalltown contractor got cold feet and forfeited his deposit of $500 rather than go ahead with it. N.M. Nelson has contract for excavation. Oct 23rd, 1913— Corner stone to be laid next week. Friday, October 31, is the day selected for the laying of the cornerstone of the sanitarium. The building is now under cover and being plastered. The rough work is all done. It remains only for the finishing touches to be made. The ceremony will begin at 1:30 in the afternoon with the program outlined as follows: music, Story City Band; opening remarks, President O.S. Boyd; addresses by Rev. T.T. Heimarck, Rev. H. Solum; address and cornerstone laying by Prof. J.N. Kildahl. Nov 6th, 1913— Cornerstone laid Friday, large crowd witnesses impressive ceremonies at sanitarium and home. Dec 18th, 1913— The structure is nearing completion, some interior finishing is yet to be done. Mr. & Mrs. Adolph C. Molstre Superintendent and Matron of Sanitarium. April 10th, 1913— The Story City National Bank has let the contract to the Krell Construstion Co. of Hampton. The old building will be moved out into the street on the east during the building of the new structure, after the completion of which it will be moved to the back of the lot, facing east Penn Ave. The agreement with the contractors calls for the vacating of the lot by April 15. 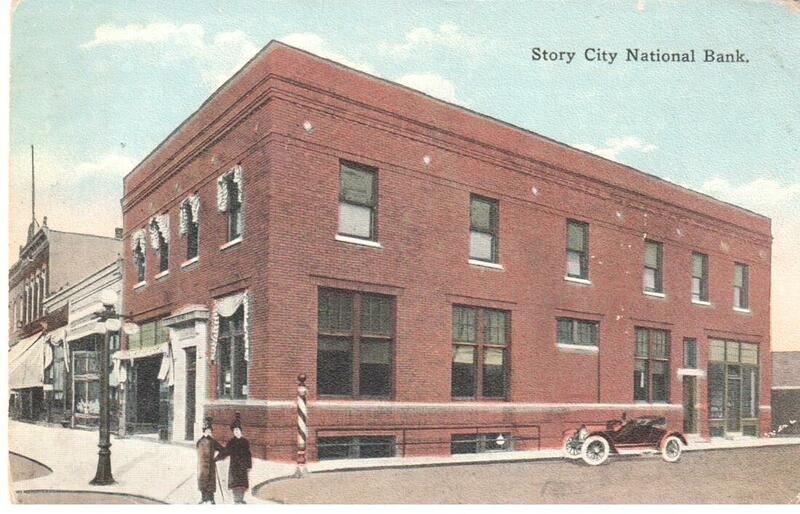 May 1st, 1913— Work on the new Story City National Bank building has started with a rush. A dozen men and several teams have just about finished excavating as we go to press. Nov 20th, 1913— Tom Knutson moved into basement of new bank building this week. Having been equipped for a first class barber shop. He will have bath tub facilities too. Dec 18th, 1913— The building has a frontage of 44 feet and a depth of 85 feet. The corner will be occupied by the bank. The balance of the first floor (extending from the front and around the back of the bank, in the of an L) is occupied by the Ladies Fashion Shop which O.O. Donhowe opened several weeks ago. Under the bank is a finely finished room, which Tom Knutson has fitted up for a barber shop with bathroom facilities. Dr. Gilberson and Dr. Frandson have suites of room in the second story front, and the rear end of the building contains a handsomely finished five-room apartment, which is occupied by Mr. and Mrs. O.O. Donhowe. The building is built of a light yellow pressed brick, trimmed with white granite– a combination which is very pleasing to the eye. No expense has been spared to make it first class in every particular, and certainly the builders have succeeded in making an improvement on their corner which does a great deal towards toning up our business street. 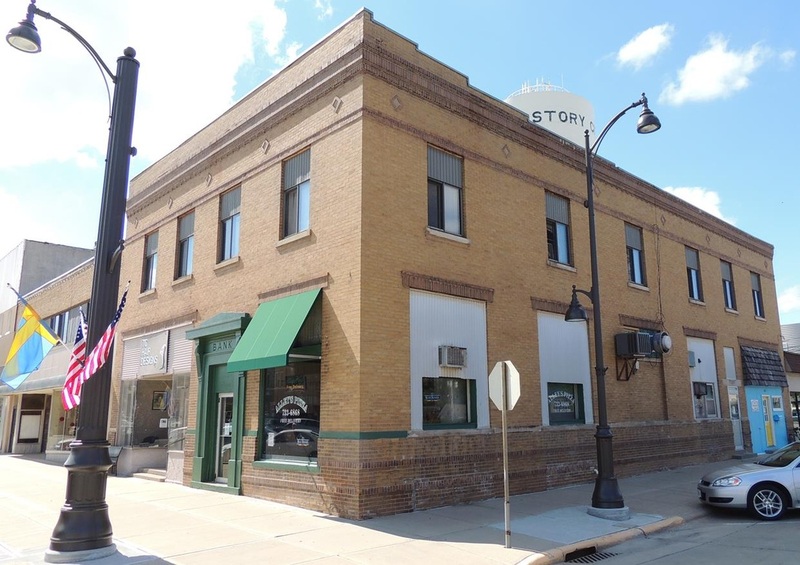 Dec 18th, 1913— The old Story City National bank building will be sold at auction next Tuesday at 1 pm, Dec 23. H.N. Donhowe, Auct. April 10th, 1913— The site is being cleared for the auditorium and hotel. The old butcher shop buildings have been torn down and the moving picture building will be moved into the street west of the hotel pending the building of the auditorium. The contract for the auditorium and hotel have not been let yet. The architect has been somewhat slow in getting his specifications ready, but it is expected they will be in hand in a few days. June 5th, 1913— The contract for the hotel and auditorium has been awarded to Mr. Cole of Ames, and work of construction is starting this week. Will Tolbertson has the job of excavating. July 24th, 1913— Masonry work has started on the auditorium and hotel building. Sept 25th, 1913—-The auditorium and hotel structure has progressed so far that even the most unimaginative can get a fair idea of its impressive proportions. The brick work is up to the second story. It is by far the largest building ever constructed in Story City. Indeed, its giant proportions would do credit to a city ten times our size! Oct. 9th, 1913—-They’re getting ready to lay the cement sidewalk in front of auditorium and hotel building. Jondall & Henderson and A.L. Munsen are also tearing out the old walk in front of their buildings and will construct a new one at the same time, thus making a solid stretch of 250 feet of new 14-foot cement sidewalk. Nov 6th, 1913—-The hotel and auditorium buildings have all been rented. Iver Egenes contracted some time ago to take the auditorium. 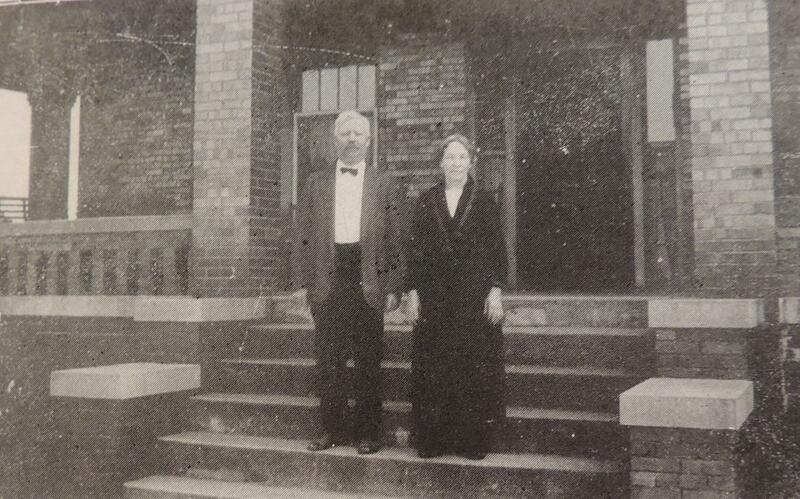 Mr. and Mrs. A.S. Maxfield of Charles City have rented the hotel. The store building which is being built next to the auditorium on the east has been rented by Heggen & Stenson, who will move their grocery store into it as soon as it is ready. The building is larger than they will need so Jondall & Henderson Furniture will take a fourth of the space. The small store room to the east of the hotel will be occupied by Visergutten— the first floor by its offices and the basement by its presses. Dec 4th, 1913—-The new opera house will be formally opened on the evening of Dec. 18. The opening play will be the well known drama, “The Two Orphans”. Tickets are being sold for the opening night at three dollars each. The opera house is near completion. Next week the interior decorators will get to work, and with the seats in place, everything will be in shape for the opening performance. The new opera house will be known as the “Grand Opera House.” The word “Grand” appears in the entrance, inlaid on the tile floor. Dec 18th, 1913—-The magnificent row of buildings was designed by Jas. S. Cox of Estherville. Cole Bros., the Ames contractors have had charge of the construction and have kept the work moving with rapidity and precision from the very start. Dec 25th, 1913—-The opening performance in the new opera house last Thursday evening proved to be an unqualified success. The place was almost filled to the last seat and the play presented was of an exceptionally high order. This carousel was built in 1913 by the Herschell-Spillman Company of Tonowanda, New York. It was originally owned by TP Gifford of Grundy Center, Iowa. Gifford traveled the Iowa countryside taking the carousel to county fairs and town celebrations, including Story City’s Independence Day celebrations. 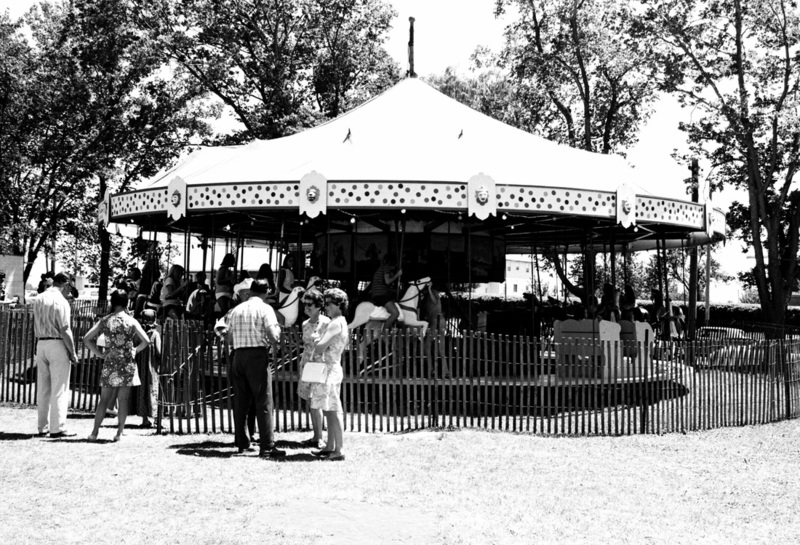 The carousel was purchased from Gifford in 1938 by the Story City Greater Commuity Congress. Eventually, time and wear took their toll, and the carousel was forced into temporary retirement in 1977. 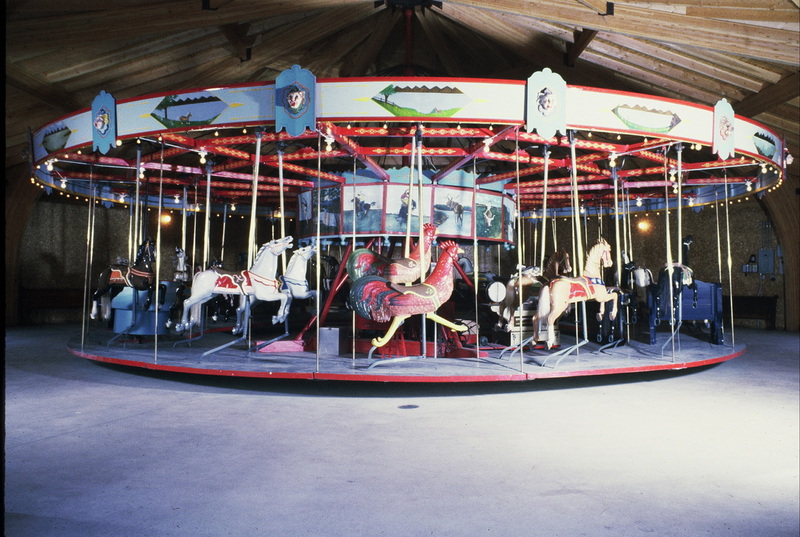 In 1980, interest in the carousel was resurrected and restoration began. In 1982, the Story City Historical Society was established to assist with fundraising to cover the cost of the restoration. A special structure was built to house the carousel. On June 4, 1982, a dedication ceremony was held to mark its reopening. The Story City Antique Carousel is open from May– September.